BEAUTIFUL DAY FOR A BOOK ABOUT STORMS. 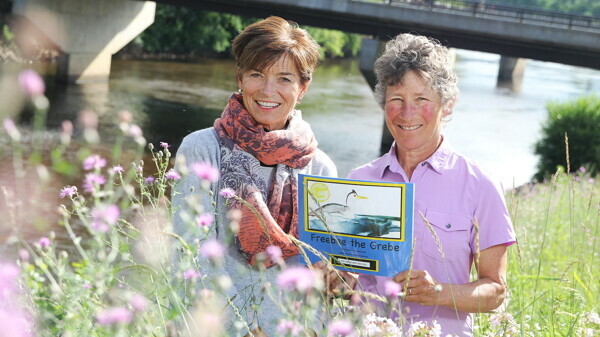 Mary Gladitsh (left) illustrated Karen Wise’s (right) children’s book, Freebee the Grebe, which stresses the importance of storms to the Earth’s environment. Karen Wise, author of the newly released book Freebee the Grebe (pronounced “greeb”), knew she wanted to put the story of the grebe down on paper the minute it came into her head. At the age of 20, the California-native was sitting on her surfboard, riding the waves of the Santa Cruz Bay, when she spotted a grebe, a large black and white bird that lives along the Pacific Coast. That’s when a story idea came into her head, and while Wise has a lot of stories floating around in her head, she knew she should write this one down. And 38 years later, the result is a beautiful book with soothing pictures and an important message. Freebee (the grebe, who was named not only because it rhymes fantastically with the word “grebe” but because of how free Karen felt on that surfboard) volunteers to find out who or what is causing so many horrendous storms in the Specific Ocean (yes, you read that right), storms that scare her friends, the birds, whales, and fish. Freebee and her friends thought that if they found out what was causing the storms, they could make the storms stop. Eventually, Freebee stumbles upon Cloud Palace where she learns where rain comes from and why storms are important to the environment. Wise has been a school naturalist for many years now, and as the years have gone on, more and more she witnesses children who are afraid to get wet. But to Karen, it’s good to get outside and run around in the rain, to experience the dirty or scary things in life. So, why did it take 38 years to bring this book to our attention? Well, although it took little time for the words to form on paper, it was getting the illustrations for the book that presented a challenge. After going through three different artists, none of whom did much, Karen gave it to her friend, Mary Gladitsch. Gladitsh did vibrant, yet calming illustrations with watercolors on yupo, which is a synthetic water-resistant paper. Because none of the watercolor is absorbed into the paper, it needs to evaporate to dry and in the process of waiting to dry, kind of does its own thing. Through the art, Gladitsh managed to capture Wise’s themes of freedom and appreciation of things that are scary, in this case, a lack of control. To get up close and personal with Freebee, sign up in advance for Beaver Creek Reserve’s Annual Board Meeting and fundraising event Children’s Night Out, scheduled for Nov. 8. The event includes a reading of Freebee the Grebe and a related art project, and everyone can get in on dinner and a chance to meet and be entertained by Wise and Gladitsh. You’ll can find Freebee the Grebe at The Local Store, Beaver Creek Reserve, The Center, Crossroad Books and Amazon.com. Or contact Wise at karengwise@gmail.com and get a personalized autographed copy of the book. So go out, get the book, and next time it rains, go play in it, for goodness sakes.